This year’s biennial was a mash-up of claims and interests that played out in four exhibitions grouped under one umbrella. 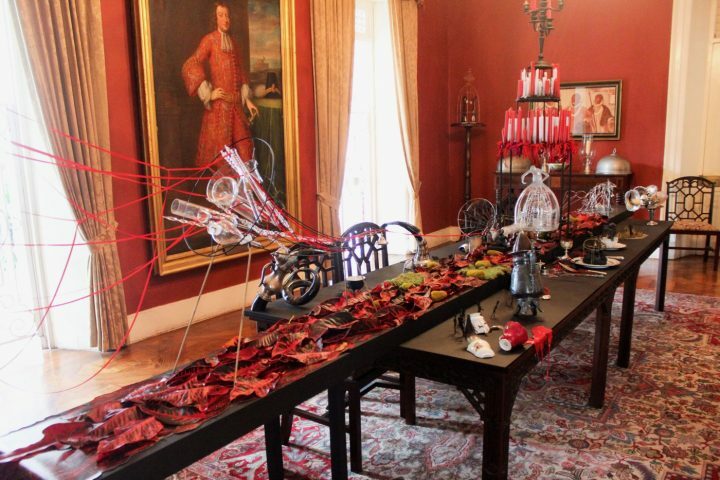 KINGSTON — What is a biennial for? What does it do? These questions came up on my visit to the Jamaica Biennial 2017, where I was invited to participate in the symposia and performances convened for the closing weekend. While looking at parts of the show and in conversation with other guests, I found myself wondering repeatedly what the aims of this national exhibition were. It eventually became clear that a thicket of bureaucratic and intensely political complexity had ended up making the biennial a mash-up of competing claims and interests. 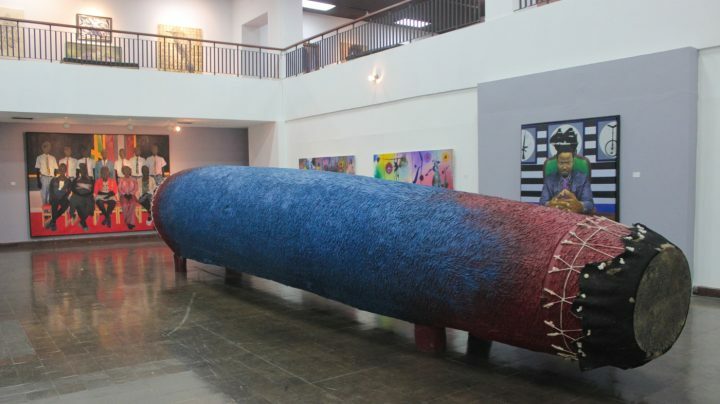 The Jamaica Biennial 2017 was actually four exhibitions at multiple sites, stitched together under one slightly leaky umbrella. Veerle Poupeye, a Belgian transplant who’s the executive director of the National Gallery of Jamaica, laid them out for me: a juried section chosen by a panel of artists, dealers, gallery directors, and curators; works by about half of a group of 72 artists who have been permanently “invited” to participate in the show by the National Gallery’s Board of Management, which some of those same artists serve on (one can see how this already starts to become unwieldy); a small tribute to the traditional, figurative painter Alexander Cooper and the recently deceased photographer and self-proclaimed “media terrorist” Peter Dean Rickards; and a selection of pieces by artists from the Caribbean and the Caribbean diaspora, grouped under the rubric of “special projects.” The final tally was about 160 artworks installed at the National Gallery; its original home, a historic building known as Devon House; and the National Gallery West in Montego Bay (which I was not able to visit). I walked through the parts of the show I could see a few times, but they never quite settled into clarity. There were several standout pieces and one or two sections where the works spoke with each other eloquently. 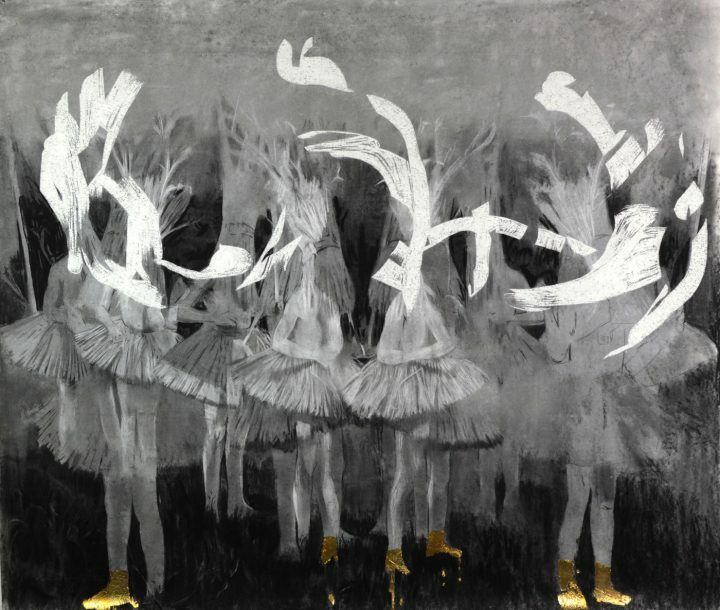 The loveliest of these contained Cosmo Whyte’s “Golden Kicks/Where you Get Dem Clarks” (2016), an ethereal charcoal drawing of a troupe of dancers wearing what look like grass skirts. The figures are interspersed among a copse of trees, which have the same hue and tone as them, but they’re distinguished by the gold leaf shoes on their feet. Whyte’s drawing created a hushed atmosphere in which I could almost feel the water lapping against a man’s head in Nadia Huggins’s “Is that a Buoy?” (2015) on the opposite wall. 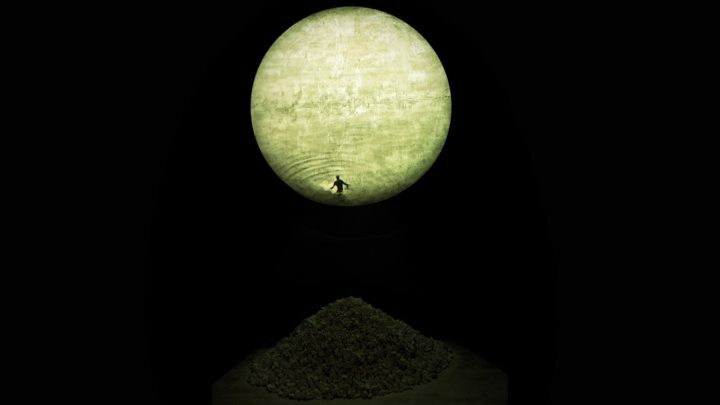 In that work, a photograph diptych and video, the figure becomes lost in the watery scene, so that his head is only barely distinguishable from a buoy. 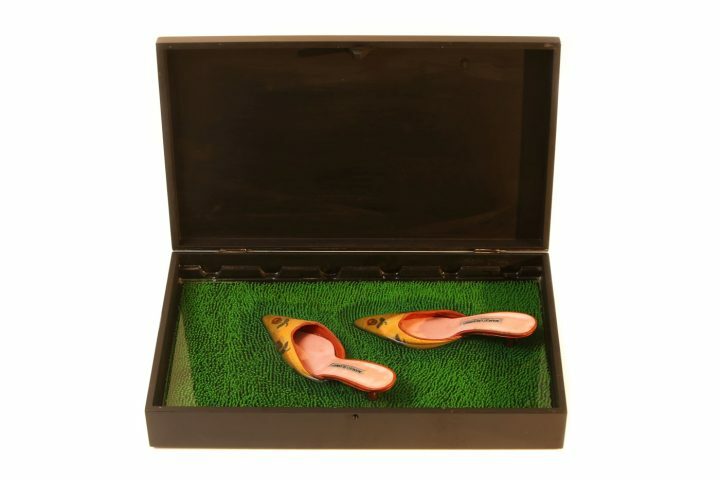 Claudia Porges Beyer took up a similar visual theme with “Splendour in the Grass” (2015), which consists of a pair of Manolo Blahnik mules almost submerged in water inside a medium-sized briefcase. The brilliantly cogent surrealist object signals the near drowning of a particularly historicized sign of femininity and elevated socio-economic status. 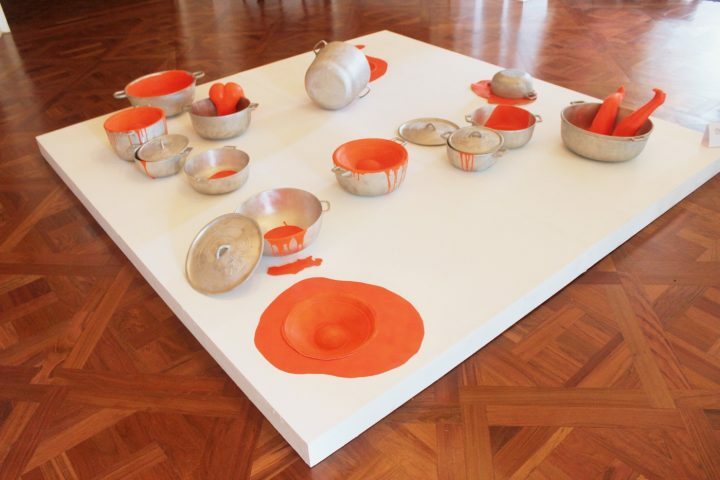 For the most part, artworks in the show simply had to hold their own space and meaning against the tumult. Some did this better than others, including Phillip Thomas’s installation “His-Sis in the Garden of Heathen” (2017), which allegedly grew from the painting at its center — an arresting portrait of a character who’s festooned with medals and has camouflaged hair like some fantasy cartoon general. I still haven’t fully figured out what relationship he has to the strip of fake grass laid down before him, along with various gardening tools such as a machete and shears, but I think about the piece days after seeing it. Marlon James’s portrait photographs are compelling because the people in them are so odd: one has lips that are a bruised purple color and a gaze so inward, his eyes might as well be closed. I was grateful for the small oasis of quiet created by Simon Benjamin’s “Urban Beaches: FORUM IV” (2016) and have long appreciated the whimsical feel of Leasho Johnson’s work, which was displayed at Devon House. I walked by Kelley-Ann Lindo’s “Send Love Inna Barrel” (2016–17) with barely a glance, but was later told by the artist Ebony G. Patterson that it needed to be activated by two people sitting at either end of the long, continuous tube created by several barrels suspended together. 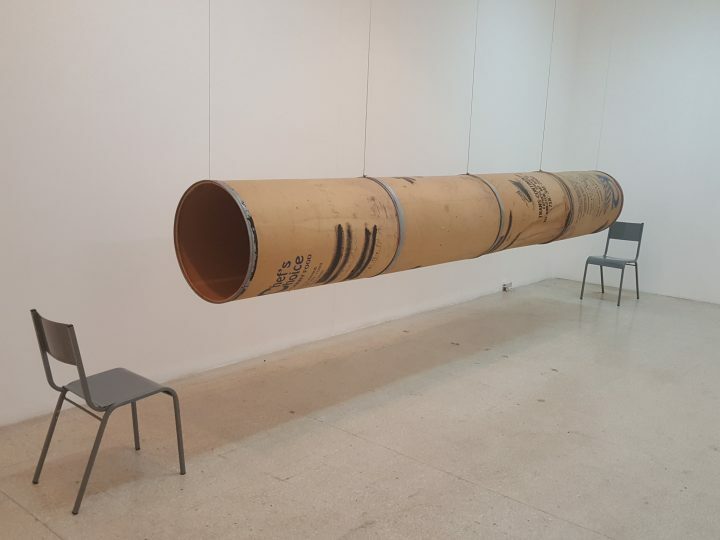 She said that the sound the piece makes when two people talk to each other through it extends the metaphor of the barrel, which is often used to send food and gifts from other countries (particularly the US) to Jamaica. I do remember, as a child, getting such barrels from my father, who was in the US at the time, and being excited to taste the Juicy Fruit gum sitting atop the other goodies. Senior curator O’Neil Lawrence acknowledged the problems, saying to me, “We know that it is an ugly baby … and that we birthed it.” However, the fault doesn’t lie with the curatorial team; it’s rooted in the politics compressed within the confines of the National Gallery, which are in turn inflected by the politics of the small island nation where I was born. In Jamaica the economic situation is even more desperate, more pressured than it has been in the US for almost a century. When my father left Jamaica in the 1960s, the unemployment rate in Kingston was almost 25%. Many people on the island still struggle to make a living, and in that context, cultural capital means a great deal. People contest each other for it. Several people I spoke with, who asked not to be named given the delicacy of the situation, said that David Boxer, the National Gallery’s previous director, despised the direction Poupeye wanted to take the museum in, despite having trained her himself. Boxer allegedly stacked the board with his friends who are similarly disposed to leaving the legacy aspect of the biennial in place. I was informed that certain members of the board are actively working to make Poupeye leave her post. 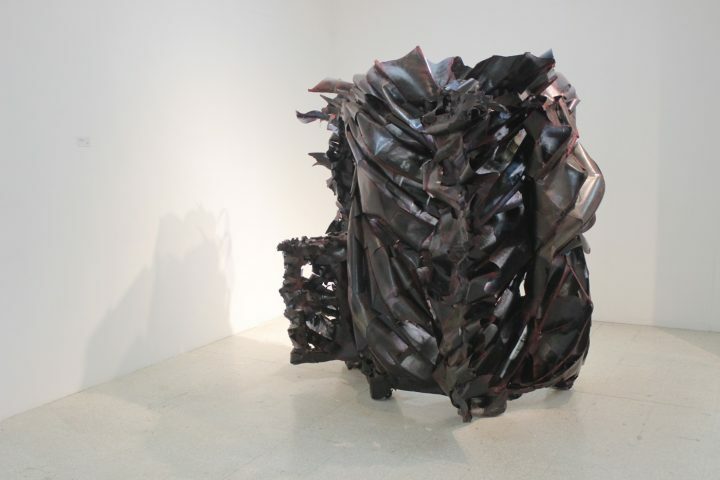 And so the organizers ended up with an exhibition in which some of the work by the permanently invited artists was terrible and brought down the worth of the whole show, but it was displayed alongside strong contributions by, for example, Margaret Chen, whose “Cross Section of a Curve” (2016), a sculpture of painted X-rays torqued as if caught in a tornado, cleverly evokes Louise Bourgeois. The obvious question is: why is it this way? And the short answer is: Jamaica is highly political. It’s an island where status is recognized, guarded, and defended. Once, at a party in London, I was asked where I was born. I responded with the name “Half Way Tree,” a neighborhood in Kingston. I was then told that this area signified a certain set of politics: not the working-class scene of Spanish Town, where my mother lives, nor the more urbane environs of New Kingston, where my father’s family now lives — but somewhere in between. Yes, even far away from the island, my birthplace is bogged down by the politics of social status. But then change happens unexpectedly. Over the weekend, David Boxer passed away after a long struggle with cancer. As sad as that is, it might also be an opportunity. 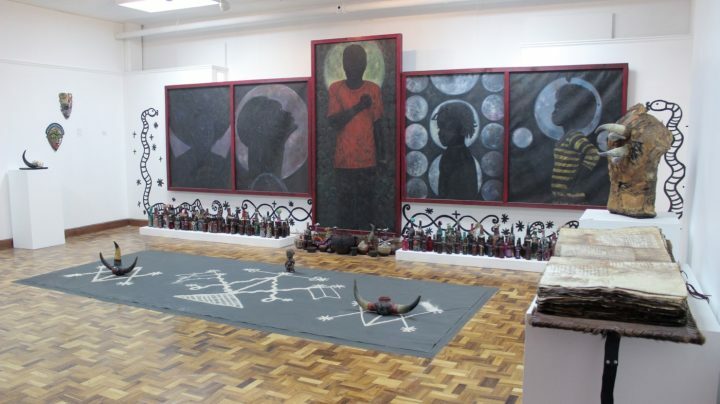 Perhaps, over the next two years, enough people who are invested in the Jamaica Biennial can forge a peace about what they want the next one to do and be. 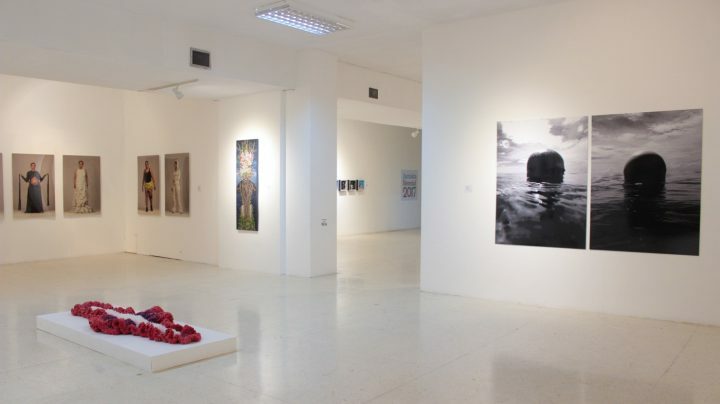 The Jamaica Biennial 2017 took place at the National Gallery of Jamaica (12 Ocean Blvd, Block C, Kingston), the National Gallery West (Montego Bay Cultural Centre, Sam Sharpe Square, Montego Bay), and Devon House (Hope Road, Kingston) from February 24 through May 28. Editor’s note: The author’s travel and lodgings were paid for by the Jamaican Ministry of Culture, Gender, Entertainment, and Sport.